Diana Eng didn't have to venture very far to uncover buried treasure. The New York-based designer was in familiar territory when she stumbled upon a pile of dusty old boxes in a warehouse in Manhattan's Garment District. 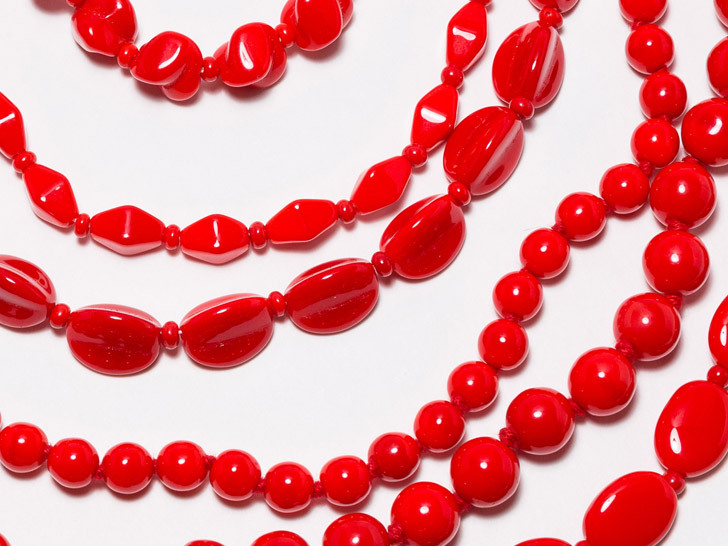 Wrapped within layers of tissue were glistening strands of Czech glass beads, circa 1950s to 1970s, in an intense shade of vermillion. Eng sorted through the stash, choosing designs that worked well in today's context. Forgotten inventory isn’t uncommon in the Garment District, Eng tells Ecouterre. “When I first started working in the Garment District in 2005, a lot of manufacturers and vendors had warehouses full of unsold inventory dating back to when their companies were founded,” she says. Eng soon discovered, however, that vendors were abandoning their deadstock, whether as a result of economic downsizing or because companies were going out of business. Forgotten inventory, some dating back to when the companies were founded, isn’t uncommon in the Garment District, Eng says. You can purchase the refurbished necklaces—they’ve been cleaned and given new brass hardware when necessary—through Eng’s website. Available in six bead designs, each piece comes in your choice of three lengths. A choker costs $36—quite a steal for your very own modern-day booty. Forgotten inventory isn't uncommon in the Garment District, Eng tells Ecouterre. "When I first started working in the Garment District in 2005, a lot of manufacturers and vendors had warehouses full of unsold inventory dating back to when their companies were founded," she says. Eng soon discovered, however, that vendors were abandoning their deadstock, whether as a result of economic downsizing or because companies were going out of business. 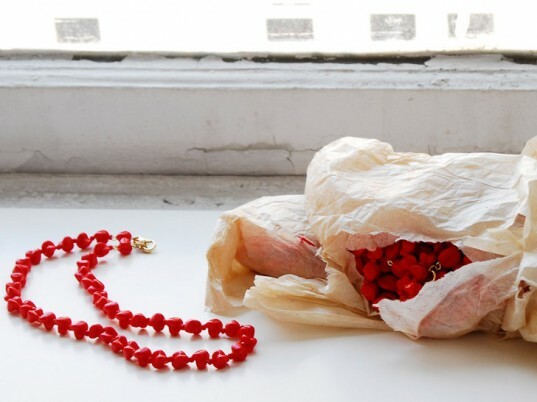 "It made me sad because I felt like there were treasures that had never been worn," she says. "Since then, I've been seeking out warehouses and going through their inventory. I've found some really neat things that I will be using for future projects as well. But these necklaces were already pretty and 'up to date' the way that they are. They just needed a little TLC." You can purchase the refurbished necklaces—they've been cleaned and given new brass hardware when necessary—through Eng's website. Available in six bead designs, each piece comes in your choice of three lengths. A choker costs $36—quite a steal for your very own modern-day booty.